Our California orange gift boxes are as extraordinary and special as the person you're sending them to. In each California orange gift box you'll find nine hand selected, tree ripened oranges are bursting with juice and flavor. Each one is delicately placed in the box with the orange in the center sitting in a "nest" of green tissue paper ready to "sparkle" upon opening by the recipient. Pearson Ranch oranges set the standard for the world's finest citrus. 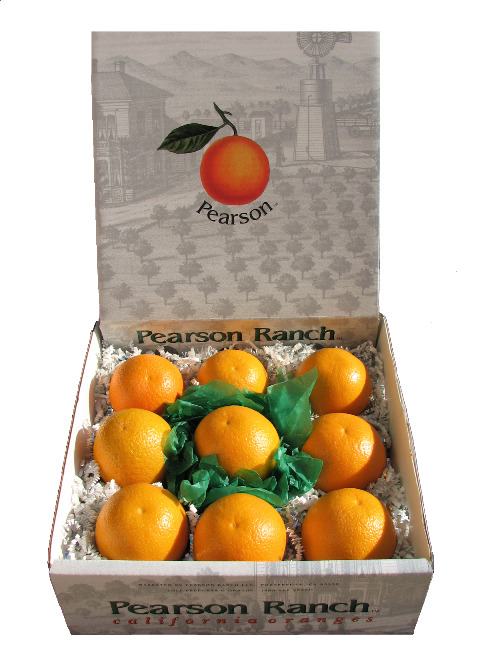 So when giving a fine citrus gift of health and taste to friends, family, co-workers, or gourmet food enthusiasts, make us your first choice with a California Orange Gift Box from Pearson Ranch for "the ultimate orange experience".